If you love dolphins, don't swim with them. Here's why. Throngs of Americans are heading south to the Caribbean right now, for the balmy sunshine, intoxicating evening breeze, turquoise waters ... and the opportunity to swim with dolphins. But despite their popularity, swim-with-the-dolphin programs have a dark underbelly, and those on the inside are starting to speak out against them. Swim-with-the-dolphin (SWTD) programs can be found all over the world, but they've become exceptionally popular in the Caribbean in the past decade or so. A former dolphin trainer, who spoke on the condition of anonymity, told The Dodo that these programs are inherently problematic - and cetaceans simply do not belong in captivity. "Dolphins are beautiful and amazing creatures in their natural habitat," says the former trainer, who requested anonymity because he still works in the Caribbean hotel industry. "But stick them in a cage, and you watch them change." Born and raised in the Bahamas, the trainer says he was employed at two swim-with-the-dolphin facilities in the Caribbean, and his concerns grew over his tenure. The dolphins' holding pens were not only excessively shallow, but also far too small. At one facility, he says, more than 40 dolphins were caged in three compact cells. In the open sea pens - as opposed to enclosed pools within a resort - debris like nails and fish hooks would float in from the ocean, he adds. "Because they didn't have a vet or any type of veterinary care at [this particular] facility, the dolphins would swallow things, and there would be nothing you could do about it," he says. Though he witnessed the enclosed pens being cleaned, he claims the smell of the chlorine was so strong, it would "choke" the trainers - and that some of the animals eventually went blind because of its use. He also maintains that many of the dolphins suffered from "psychosis," a behavior not unheard of in marine mammals forced to swim in small pens all day long. They were also under extreme pressure to perform, which may have made them dangerous to humans, he says: "They did 10 interactions a day ... the same motions, the same speech, the same signals over and over. They would get frustrated ... and aggressive to guests or knock food buckets out of our hands." The former trainer's most troubling allegation, however, is that some female dolphins prevented their new babies from breathing - by stopping them from coming to the surface. The trainer, who isn't a scientist, said he and his colleagues deduced the mothers did this because they didn't want their babies to "live in captivity." Though that allegation can't be proven, another former trainer has echoed other worries. 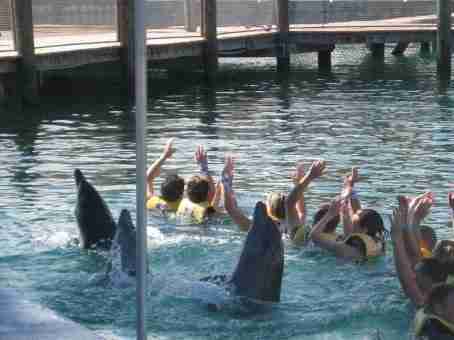 Moreover, studies have pointed to some issues with dolphin captivity in general. According to a World Animal Protection/Humane Society of the United States report called "The Case Against Marine Mammals in Captivity," cetaceans in captivity are routinely given antibiotics and ulcer medications, are in need of vitamin supplements because they are being fed nutrient-deficient frozen fish and have a history of premature death from a variety of causes. What's wrong about swimming with dolphins? "Swim with the dolphins" (SWTD) is a general term for a variety of dolphin-themed itineraries. Besides swimming with a dolphin (or two), you can be photographed with a dolphin, pulled through the water by a dolphin (the "dorsal tow"), smooched by a dolphin or pushed by the beak of a dolphin. You can even pay to be a dolphin "trainer," complete with a whistle and training manual. The WDC documented many welfare incidents in the Caribbean in a 2010 paper called "Captivity in the Caribbean." In one facility in Antigua, dolphins were found to be "unusually dark" due to shallow enclosures and subsequent sunburn; some were found to be held in isolation for training purposes; and some were exposed to polluted water. "Although some Caribbean countries have developed legislation to address these captive dolphin programs, regulations are rarely enforced, and facilities operate under the radar in most, due to the lack of capacity and oversight," Vail told The Dodo. Ceta Base is a site that logs the capture, transport and death rates of captive dolphins around the world. At The Dodo's request, Ceta Base estimated there are some 240 dolphins - both wild-caught and captive-bred - in facilities across the Caribbean, and that most of the wild dolphins hailed from Cuba, Honduras and the Gulf of Mexico. Forty of these dolphins are at Dolphin Cay, a popular facility at Atlantis, a resort on Paradise Island in the Bahamas. Opened in 2007, Dolphin Cay is a 14-acre lagoon with "seven million gallons of natural Bahamian ocean water," says Greg Charbeneau, vice president of Marine Operations. The first dolphins to live at Dolphin Cay were relocated from the Marine Life Oceanarium in Gulfport, Mississippi, after Hurricane Katrina in 2005. The transfer was well-publicized and was also the subject of a 2007 book, "The Katrina Dolphins: One-Way Ticket To Paradise." Since Atlantis is one of the most popular facilities, The Dodo reached out for a response to welfare concerns with SWTD programs. Atlantis prioritizes the well-being of its dolphins with a team of 90 specialists and veterinarians to "ensure their safety and comfort at all times," said Charbeneau in an email to The Dodo. He also explained that dolphin programs help teach people about marine mammals and conservation, and it is one of Atlantis' passions to conserve marine life. Atlantis is accredited by both the Association of Zoos and Aquariums and Alliance of Marine Mammal Parks and Aquariums and is also a member of the International Marine Animal Trainers Association, he notes. Sam Duncombe, the director of reEarth, a Bahamian grassroots organization that was behind the closure of another SWTD facility in the Bahamas last year, disagrees with some of Charbeneau's claims. Born and raised in the area, Duncombe told The Dodo she's been fighting against the development of dolphinariums - including the Atlantis - for nearly 25 years. "[The Katrina dolphins] were bought, not rescued," Duncombe says. "It was greenwashing in a big way." Duncombe also maintains that the cells the dolphins are in are "horrible." "When I saw what they had built [for the dolphins], I cried," she said. "The bloody fish in the aquarium have more than [them], with corals and rocks. These dolphins just have bare white concrete pools." In fact, Duncombe's concern about the depth of the pools is shared by scientist Naomi Rose, from AWI, who says that dolphins routinely dive to 60 feet. Ten feet, she argues, "is far too shallow!" How did dolphinariums in the Caribbean get so popular? In short: the cruise ship. "Every proposal for a new swim-with-dolphin facility was premised on the need to meet the demand from cruise ship tourism," says Rose, who notes the trend really took off in the 2000s. Some dolphinariums, she points out, don't even have parking lots: Tourists simply debark, swim with the cetaceans, then re-board their giant boat. Statistics gathered from the Florida-Caribbean Cruise Association show there's no sign of a slow down. Its most recent report ranked the Caribbean the most popular cruise destination, owning about 37 percent of the market share in 2014, up 3 percent from the year before. "Unless you stop the demand side, which is those great many cruise ship passengers and North American tourists, you will continue to see dolphinariums open in the Caribbean," says Diana McCaulay, CEO of the Jamaica Environment Trust (JET), which has protested dolphinariums in Jamaica. 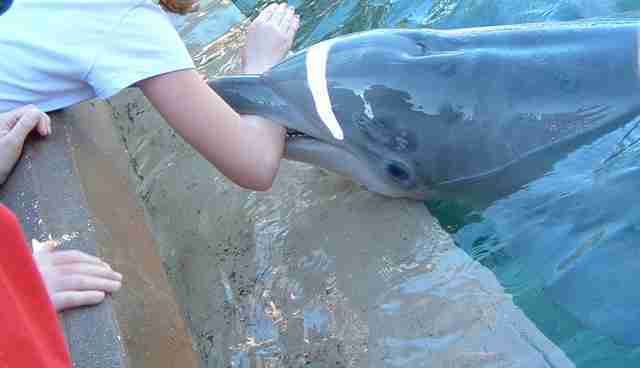 McCaulay told The Dodo that the process of capturing dolphins in the wild is "very traumatic." "They are chased into nets ... they are rounded up, the ones they want are selected, then they are lifted up into a boat and transported," she explains, adding that female dolphins are preferred because they are more "trainable." Moreover, "methods used to transport cetaceans can also be inhumane, and many individuals have died as a result of injury and stress brought about by efforts to supply captive facilities around the world." Although some places still capture dolphins from the wild, many in the Caribbean stock their facilities with captive-bred animals. Another prominent company in the Caribbean is Dolphin Cove, based in Jamaica. Dolphin Cove Ltd. owns a number of dolphinariums in the region and has won a World Travel Award - "the Oscars of the travel industry" - since 2011. The owners of Dolphin Cove, Stafford and Marilyn Burrowes, recently told The Jamaica Observer that the company launched a captive dolphin breeding program four years ago. Five of its dolphins have since given birth. "These days it is almost impossible to get dolphins from the wild because of the actions of animal rights groups," Stafford Burrowes told the newspaper. Dolphin Cove did not respond to The Dodo's request for comment. reEarth's Duncombe says one of her numerous concerns about breeding is that the captive-bred dolphins are losing their instincts: "What these facilities are doing ... is creating a whole substructure of animals who have no way of living in the wild." "Your desire to be with them - is killing them."